Our frequently asked questions will help you work out what size car tyres or other passenger vehicle tyres you need. You will also get some tips on how to keep your tyres lasting longer and most importantly make sure they’re safe. We offer Free Tyre Safety Checks so if you are ever unsure call in anytime and we will happily inspect your tyres with you. For a great range of cheap tyres Gold Coast we are centrally located in Bundall and service all neighbouring areas like Southport, Carrara, Molendinar and Benowa. 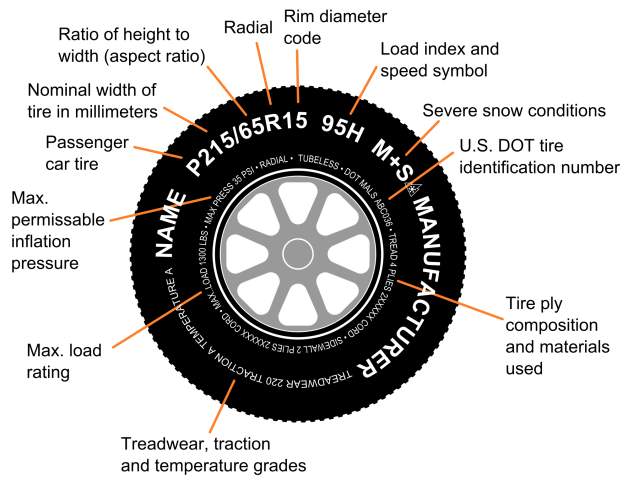 On a tyre you will find the manufacturer’s name and the name of the tyre (eg. Pirelli Pzero) and also a set of numbers that relate to the size of the tyre. You should also refer to the vehicle manufacturer’s tyre placard, usually found inside the driver’s door sill, glove box or under the bonnet to check that the correct size for your vehicle has been fitted. Some vehicles do come standard with a few size options and these will be listed here. How often should my tyre pressures be checked? It is important to maintain the correct air pressures so your tyres can give you maximum performance including mileage and tread wear. Over or under inflated tyres are the most common cause of tread wear. Tyre pressures should be checked once a fortnight or at least once a month. For correct results, make sure your car has not been driven on for at least 3hrs, Tyre pressures should be checked when the tyres are cold as pressures increase as the tyre becomes hot. I have a puncture, what should I do? A puncture in your tyre can cause your tyre to deflate rapidly. It is important to have a punctured tyre inspected immediately to avoid permanent wheel damage. The first thing to do if you have a punctured tyre is to change that tyre to your spare. Can you repair a flat tyre? The area of the tyre where the puncture occurs will determine if the tyre is repairable. Generally, punctures that occur in the tread of the tyre are repairable. A tyre will need replacing if there are sizable punctures to the tread or if the puncture occurs in the tyre shoulder or sidewall. A puncture repair involves deflating and removing the flat tyre from the rim, assessing and repairing the puncture before re-fitting the tyre to the rim, and balancing the tyre. It is then fitted to the vehicle. What is causing my tyres to wear unevenly? 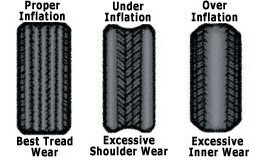 Shoulder Wear can be caused by; an underinflated tyre, an overloaded vehicle, a bent axle beam, rotations not properly timed or lack of wheel alignment. Sidewall damage is very hard to identify, generally it is the result of impact damage. In most cases if it is not clearly impact damage, the tyre will need to be cut open to determine the cause. Centre wear can be caused by over inflation or incorrect tyre fitment for the wheel. Flat spot can be caused by a faulty brake system, rapid starting or sudden braking or imbalanced wheel weights. Please come and see us for closer inspection. Tread wear indicators are located at the base of the main grooves and are equally spaced around the tyre. These indicators look like narrow strips of smooth rubber across the tread and will appear on the tyre when that point of wear is reached. When you see these wear bars, your tyres should be replaced. If you are unsure, please come and see us for closed inspection. The most common cause of your steering wheel shaking is your wheel balance. It is important to have this checked as soon as possible. Besides causing steering wheel vibrations, seat vibrations and increased fuel consumption, an improperly balanced wheel reduces road holding ability. Only perfectly balanced wheels will give you the assurance that you can keep control of your vehicle. Yes, it is legal to fit non runflat tyres to vehicles that come standard with runflat tyres. It is important to check whether your vehicle has a spare tyre or allocated storage space for a spare. If not, your vehicle will be potentially stranded in the event of a puncture. Regularly inspect your tyres for uneven wear, cuts or punctures. Do my new tyres come with a warranty? All brand new tyres come with a full manufacturer’s warranty. This is valid for the life of the tyre and is calculated on a pro-rata basis. Tyres deemed by the manufacturer to have a manufacturers fault, will be replaced on a pro-rata basis. For example, if the tyre is 50% worn, you will only pay for 50% of the replacement cost. You must maintain your tyres to an acceptable standard in order for the manufacturer’s warranty to remain valid. This includes a rotation, tyre balance and wheel alignment every 10,000kms or 6months (whichever comes first). A manufacturer’s warranty does not cover tyre damage as a result of road hazard, wilful damage or improper use.